This is yet another installment of the continuously prolific mail-art collaboration concept pursued by Telepherique. Instead of brittle shimmering textures of "Nan Tikum Remixes" previous full-length collaboration between these artists) we are treated to spacious soundscapes built around various organic sounds collected and manipulated by Klaus Jochim and Yann Jaffiol. Despite its overly suggestive naming conventions, "Analogic-Computer Symbiose" does not come across as a soulless exercise in sound manipulation; at the same time it does not suffer from overly anthropomorphic motives, remaining distant and abstract, often (surprisingly) contrary to the nature of its samples. What attracts me in this work is its combination of deep textures that retain their usual emotional (and melancholic) nature and subtle rhythms that create a structural undercurrent going throughout the whole album. Comparing this with other Milkies' work, I can definitely see the similarities, but at the same time it is obvious that this is a new incarnation of their style, enriched and deepened by unexpected found samples that add a completely different dimension to their music. 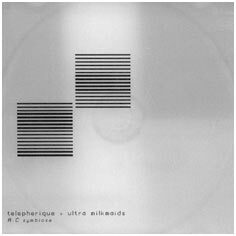 This is an engaging, carefully composed and seamlessly flowing work that combines a slight provokingly surreal touch (that should be familiar to Telepherique's fans) with detached and yet emotionally moving stream of sound that has been Milkies' trademark for years.